I have a head mount but want to mix up the camera angles a bit, so I'm looking for ideas and what others have done and get some feedback on what's worked best for you. DIY or purchased. I want it setup as a telescopic pole fitted permanently to one side of the yak. It will need to have two 360degree pivot points one down where is mounted to the kayak and another up the camera end for complete adjustment in any direction, like ram mounts. Have done a search and afew came up but none were to my liking. Show me what you've done if this sounds like something you have done or have, or if you've seen a good one you can buy off the shelf or eBay etc.... thanks! 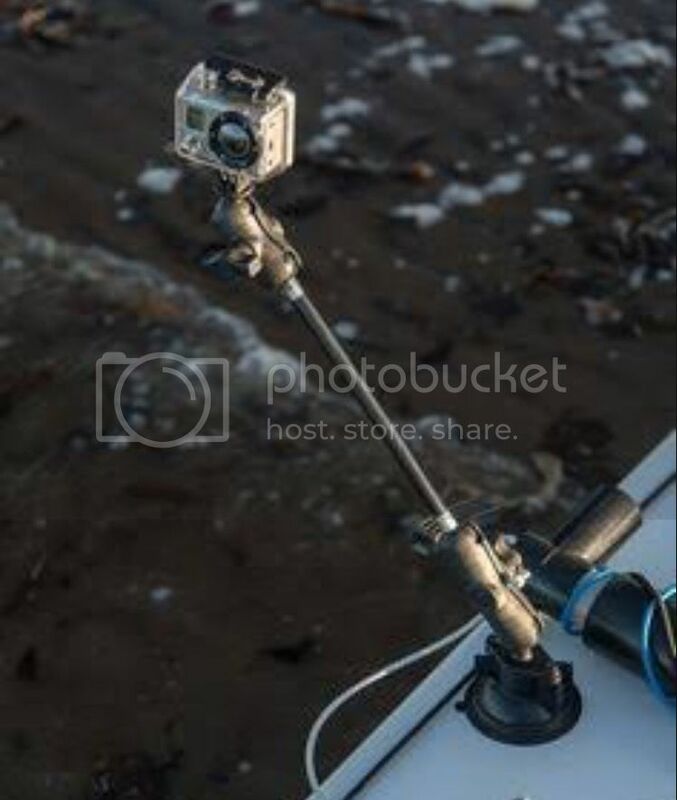 Re: Show me your GoPro camera mounts ! go and buy the Railblaza camera boom 600. it is what I use. I see they actually sell a telescopic pole separately, I've never used their gear, is it all interchangeable so you could swap out the standard pole for the telescopic one? I got myself a generic version of the GoPro 3-Way. I took the handle off and modified the connection to allow it to connect to a surfboard mount, mounted at the front of the kayak. At this stage I don't have a rotating top mount, only on the bottom. Picked up the 3way for about $15 of ebay. Is doing what I require of it at this point, but there are definitely going to be better ideas around. I think the railblaza ones with a telescopic pole look useful. As I only got mine recently, I haven't had a chance to brainstorm other ideas, yet. All in good time. I look forward to seeing some vids once you get more mods done. Your vid of the bass running hot was great. Also, have a look at 'The Jam' mount. It has a swivel bottom and top. I reckon you should be able to fit or modify the 3-way or other extension to fit where the main pole is, or even just steal the top part for another mount to give you the swivel. Just a thought. Ash, 600mm is plenty of distance for the camera to be away from you. The longer the arm, the more leverage it puts on the mounting point which causes flexing of the mount and bouncing of the camera. You can join two 600 booms together to get to 1200. What is it you are trying to do ... I have a few things/ideas that get the camera a distance from the yak. I did notice the mounting arm joint looks a little flimsy, I'll go into whitworths and have a look see if it's going to be what I'm looking for. Have seen some great DIY mounts utilizing parts of camera tripods and other bits and pieces, and could probably get what I want for less than half the price of the railblaza products. Hey mate I am not sure if you have already sorted this out but while looking for a mount I found that Ram make a universal ball that clamps to painters poles etc. You could attach any kind of pole up to 30mm I think it was. I ended just going to jb hifi and grabbing a go pro 'the arm' and mounted it to the side of the yak on a ram mount I already had. Does the trick and with the ram can move it around to any position with ease.